A Whole New Perspective: Try Calendar View! Blog / News / A Whole New Perspective: Try Calendar View! 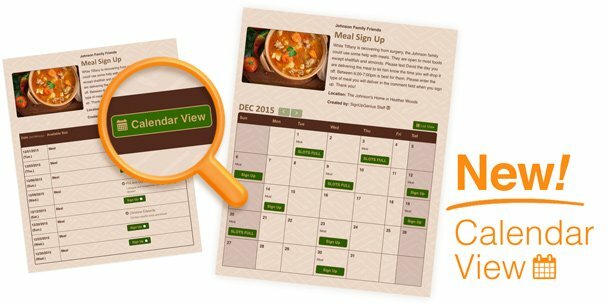 SignUpGenius is introducing its newest feature, Calendar View, just in time to help you manage your busy schedule during the holidays. What’s special about it? Calendar View will change how you look at your sign ups — literally! If you’ve ever been bogged down by events that have multiple or recurring dates, Calendar View offers a solution. Sign up creators can set Calendar View as the default setting when participants arrive on their sign up. Users can easily switch back and forth between the new view and traditional List View at anytime. They can also sign up for a slot using either option. Coordinate ongoing school volunteer needs like weekly class helpers, lunch monitors and carpool duty. Organize Sunday volunteers or church small group responsibilities, so you can easily see who’s teaching over multiple weeks and months. Sign up for team snack or concession stand duty on weeks that work for your calendar as winter sports begin. Arrange appointments or schedule shifts for your business. People can still swap dates! As your calendar starts to fill up this month, don’t stress! Calendar View gives you one more way to stay on track this season. We don't have a way to display the location rather than the slot title in Calendar View. You might try incorporating the location into your slot title. If you have other questions about your sign up, please contact us directly at http://www.signupgenius.com/help or choose "Help" under the More tab at the top of the page. I'd like to display the location instead of the slot. Is that possible? At Step 4: Slots, scroll to the end of the page where you will see the heading 'Advanced Settings.' Click on the (+) sign and the Advanced Settings options will display. Locate the last option: Show Calendar View by Default and click the option to the 'On' position. Keep in mind, the calendar view is available only for multiple date sign ups. Remember to select 'Update' to save the changes to this setting. How can I make Calendar View the default View that my volunteers will se? We do not allow sign up creators to embed entire sign ups. You must direct your users to our site to use our system. However, we have a great feature called a Web Button that you can use to create an index page that shows all sign ups created in your account. To create the Web Button, log into your account and on the left side of your account page, click Goodies. Beneath the logo options you'll see the Web Button Builder. Follow the directions to build your button. You will see the code to use to embed the button into your website. Alternatively, we have a brand-new Calendar Sync feature that enables SignUpGenius Pro users to create a subscribable calendar. Creators who choose this option can allow participants to sync an entire sign up to their personal digital calendars. These calendars can be filtered by filled or unfilled slots, or show both. You can learn how to use this feature by viewing the Manage Calendar Subscriptions tutorial in our library of Tutorials after clicking this option under the Help tab. is there a way to embed the calendar on a webpage? The new Calendar View is helpful for creators who want to allow their participants to easily select their slots based on the day of the week. The limitation of this format is that all of the details are not visible when viewing the calendar. In order to view the details within Calendar View, you can switch to List View by clicking the button at the top right corner of your sign up. This will change the current view, without changing the setting for your sign up which is determined in Step 4, Advanced Settings. 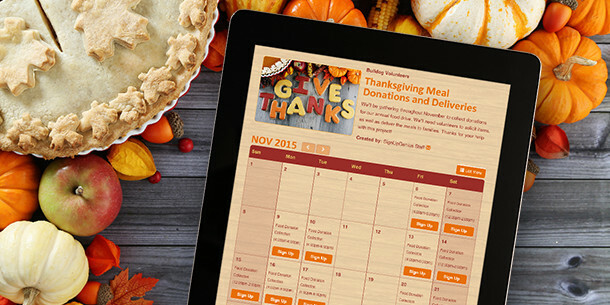 You can also click the Sign Up button to view the details for a specific date on the calendar. If you have further questions, please contact us directly using the Help tab. I am trying to use the calendar view and when I click on my signup, I can't see all the details while using this view. Using list view, all details of the signup are visible. Is there a fix for this issue? I can't find any info in the FAQ's about the calendar view.